A Washington lobbying firm has told Saudi Arabia it will no longer represent the kingdom, as international furor builds over the disappearance of journalist Jamal Khashoggi. A person familiar with the move says The Glover Park Group informed the Saudis on Monday of the decision. The person wasn't authorized to speak publicly and requested anonymity. Disclosure records filed with the Justice Department show the firm has been providing the Saudi Embassy with "government relations and communications counsel" for $150,000 a month. The decision underscores the growing pressure facing Saudi Arabia. Khashoggi hasn't been seen since entering the Saudi consulate in Istanbul two weeks ago. He wrote columns critical of Saudi Crown Prince Mohammed bin Salman. Another lobbying firm, The Harbour Group, severed its contract with the Saudi government late last week. 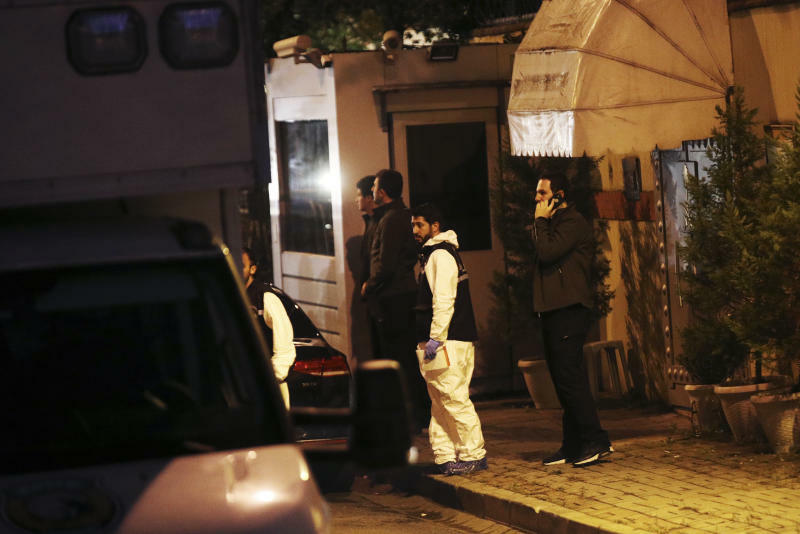 Saudi Arabia is reportedly ready to concede that a missing Saudi writer was killed in its consulate in Istanbul. A Washington think tank has announced it will no longer accept financial contributions from the Saudi Arabian government following the disappearance of journalist Jamal Khashoggi. An emailed statement from the Middle East Institute says the organization's board of governors expresses its shock and outrage over what it calls Khashoggi's "possible murder." The statement describes Khashoggi as a "friend of the Institute and a frequent participant in its public panels and conferences." The statement doesn't define what constitutes a donation from the Saudi government. The Institute also doesn't disclose the exact amount of contributions. Information on its webpage shows that in 2017, the Institute received between $100,000 and just under $1 million from Saudi Aramco, the state-owned oil company. The Saudi Arabian embassy donated between $50,000 and just under $100,000. 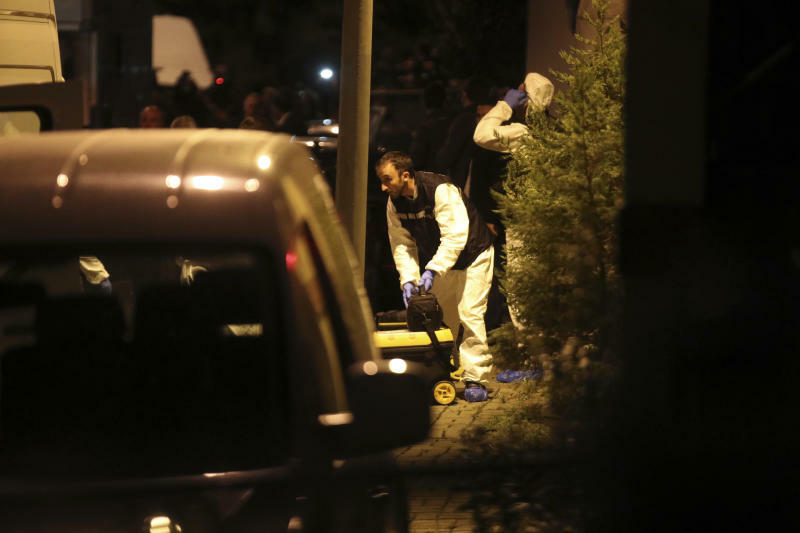 Turkish crime scene investigators have searched the Saudi Consulate in Istanbul over the disappearance and alleged slaying of Saudi writer Jamal Khashoggi. The search came nearly two weeks after Khashoggi, a Saudi critic, vanished after entering the building. 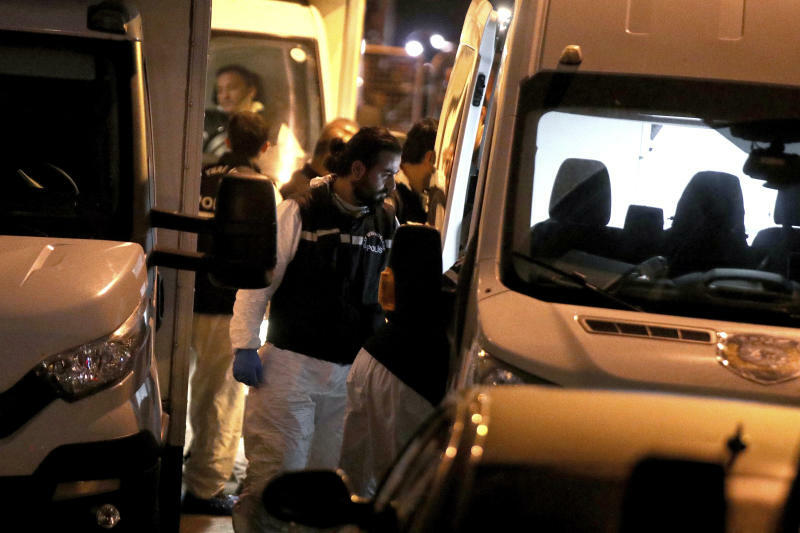 A joint Saudi-Turkish team arrived at the consulate in Istanbul's upscale 4th Levent neighborhood as journalists filmed and shot photographs of their arrival. A cleaning crew walked into the consulate hours ahead of the investigative team's arrival. Turkish officials have said they fear a Saudi hit team killed and dismembered Khashoggi, who wrote columns in the Washington Post that were critical of Saudi Crown Prince Mohammed bin Salman. A Spanish government spokeswoman has urged Turkey and Saudi Arabia to launch an "open, transparent" investigation into the disappearance of Washington Post columnist Jamal Khashoggi nearly two weeks ago. Spain, a longtime commercial ally of the government of Riyadh, is joining growing international concern over the writer who vanished on a visit to the Saudi consulate in Istanbul on Oct. 2. Spanish Education Minister Isabel Celaa says that "Spain demands an open, transparent investigation," and that "freedom of speech and press freedom are pillars of democracy." A Foreign Ministry statement on Monday said Spain is hoping for "urgent results" from the probe. Spain's strong trade and investment ties with Saudi Arabia were put to a test earlier this year when the center-left government in Madrid tried to cancel a weapons sale to Riyadh only to backtrack weeks later over fears of losing a job-intensive shipbuilding contract. Jamie Dimon, JPMorgan Chase's chief executive and chairman, has decided not to participate in Saudi Arabia's "Davos in the Desert" event this month as the outrage over the disappearance of journalist Jamal Khashoggi continues to grow. Dimon was asked last week if he was going to participate in the event, but declined to comment. A JPMorgan spokesman said the bank was not giving any additional comment on Dimon's decision to pull out. Khashoggi was last seen entering the Saudi Arabian consulate in Istanbul, Turkey on October 2. Turkish officials have said they fear a Saudi hit team killed and dismembered Khashoggi, who wrote critically of Saudi Crown Prince Mohammed bin Salman. Turkey says an "inspection" of the Saudi Consulate in Istanbul is expected to take place late this afternoon, nearly two weeks after Jamal Khashoggi disappeared there. A Foreign Ministry official told The Associated Press on Monday that the inspection would be a joint one carried out by Turkish and Saudi officials. He spoke on condition of anonymity in line with government regulations. The inspection comes after the disappearance of the Saudi writer, who vanished Oct. 2 on a visit to the consulate. Turkish officials fear Saudi authorities killed and dismembered Khashoggi. Saudi Arabia calls the allegation "baseless," but has yet to explain how the writer simply vanished while visiting the consulate as his fiancée stood outside waiting for him. Pakistan has urged Turkey and Saudi Arabia to work together to resolve the case of missing journalist Jamal Khashoggi, who disappeared on a visit to the Saudi Consulate in Istanbul earlier this month. Turkish officials fear that Khashoggi, a columnist for the Washington Post, was killed inside the Saudi Consulate when he went there on Oct. 2. Pakistan, which enjoys friendly relations with both Turkey and the kingdom, says it hopes that the "two brotherly countries will be able to jointly address the matter." A statement from the Ministry of Foreign Affairs says that since an investigation is ongoing into the matter, "it would therefore be appropriate to await the outcome." In Monday's carefully worded brief statement, the ministry welcomed Saudi and Turkish efforts to resolve the issue. Australia's foreign minister says she is deeply concerned by the disappearance and suspected murder of Saudi journalist Jamal Khashoggi. He vanished during a visit to the Saudi Consulate in Istanbul almost two weeks ago. Foreign Minister Marise Payne says she is discussing with government colleagues and officials in her department how Australia will react. She told reporters: "I have expressed my very deep concerns over what appears to have occurred in Turkey. I will be speaking with my colleagues to determine Australia's next step." The Arabic-language daily Okaz wrote a headline on Monday in English warning: "Don't Test Our Patience." It showed a clenched fist. The Saudi Gazette trumpeted: "Enough Is Enough." The Arab News said: "Saudi Arabia 'will not be bullied'." The Arab News' headline was above a front-page editorial by Dubai-based real-estate tycoon Khalaf al-Habtoor calling on Gulf Arab nations to boycott international firms now backing out of a planned economic summit in Riyadh later this month. Al-Habtoor wrote: "Together we must prove we will not be bullied or else, mark my words, once they have finished kicking the kingdom, we will be next in line." Saudi Arabia has threatened to retaliate for any sanctions imposed against it. President Donald Trump says the oil-rich kingdom deserves "severe punishment" if it is responsible for the disappearance and suspected murder of Washington Post contributor Jamal Khashoggi. The warning from the world's top oil exporter came Sunday after a turbulent day on the Saudi stock exchange, which plunged as much as 7 percent at one point. The statement was issued as international concern grew over the writer who vanished on a visit to the Saudi Consulate in Istanbul over a week ago. American lawmakers have threatened tough punitive action against the Saudis, and Germany, France and Britain jointly called for a "credible investigation" into Khashoggi's disappearance.